Right, I have to take a slight risk here: As I probably will almost be in bed sleeping by the time it goes live and won't be able to ‘live blog’ it I'll have to trust that everything will go to plan and the site will go live without any problems at midnight. 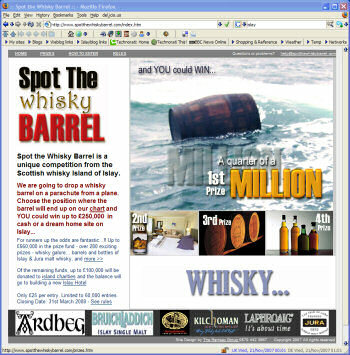 The site in question is Spot The Whisky Barrel (I believe Spot The Barrel also still works, but will redirect you). 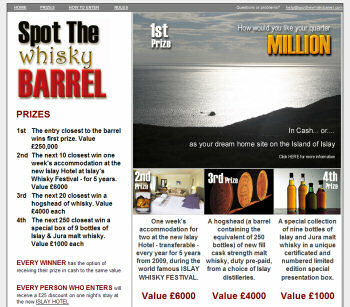 It is a really unique competition from Islay with some impressive prizes. So what is it all about? Islay, the new hotel in Port Ellen, whisky barrels being dropped from a plane, some unique Islay and Jura whisky collections, those kind of things. So how does it work? Quite simple (or tricky, depending on how you look at it): A whisky barrel attached to a parachute will be dropped from a plane just south of Port Ellen, Islay. The place where it lands will be recorded. This event will happen after the competition entry closes. Until then you have to guess or even better calculate where the barrel will land. You will be given some information about speed, height etc of the plane. You can try to find out the prevailing wind and weather conditions etc at the time of the event. And then estimate or calculate where it will land. I'm sure some geeks and mathematicans out there can develop some sophisticated models for this, others (like me) will have to rely on their intuition. So how about the prizes? You can read the details on the site, but in summary a dream house on Islay, accommodation in the new Islay Hotel and several Islay and Jura single malt whisky prizes. There is also a special prize for guessing the correct name of the new hotel in Port Ellen, Islay. Not something you can win every day. OK, it isn't free, but I think that's £25 well spent. Even if you don't win, a large part of the takings will go to various Islay charities. With that I'm off to bed. I hope I've got the main points right I've written above. If there are any critical mistakes I'll try to fix them as soon as possible. Otherwise I'll probably just post an update later. 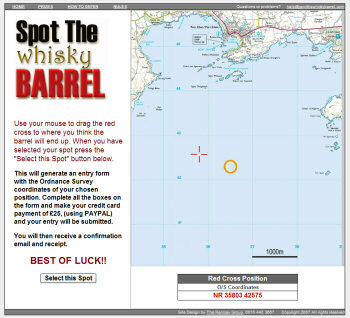 If you have your own website/blog/forum (especially if it is Islay and/or whisky related) and like what you see please help to spread the word of Spot The Whisky Barrel! Good luck!